I think if you would ask Nebraskans what time of the year was their favorite; many would say it was fall. 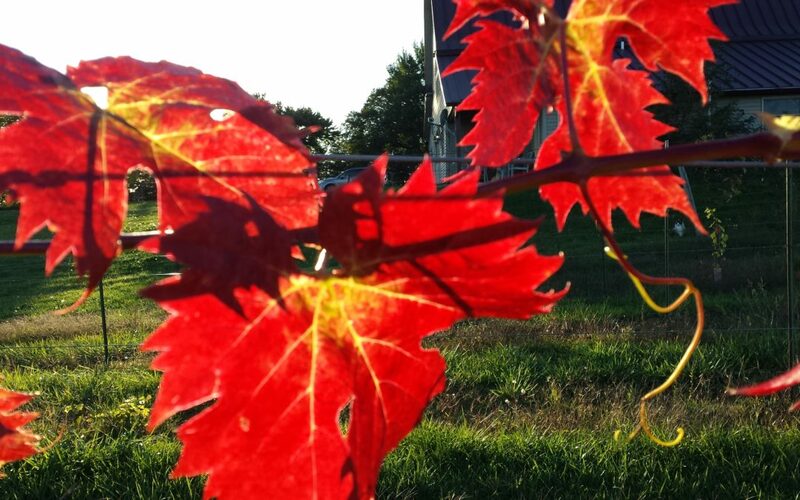 In the wine business fall is the culmination of all of the hard work in the vineyard that can pay off in fruit that hopefully is the best it can be on any given piece of ground. Even though grapes and hops are two of very few crops that are grown in Nebraska that are native,(wild grasses and flowers would be another example), our hot days, and hot nights in the summer months, can be detrimental to good grape chemistry. Also, because of where we live, our ever present violent thunderstorms can blow down both vine and trellis and ruin vines and grapes from even small hail stones. Whether Horace Greely actually coined the phrase “Go West Young Man” or not, I believe there was probably a parenthetical attached to that phrase, in which it prompted everyone to stop in Nebraska. If you followed these instructions you would be able to survive anywhere else, with only minor setbacks. In eighteen seventy-six,Thomas Volney Munson, the man who only a few years later would save France’s wine industry from the phyloxera epidemic, decided to move from the Lincoln Nebraska area to Denison Texas, because the Nebraska climate was unsuitable to carry out his plans for grape breeding. I talk a bit more about Munson in my post: “Old Methods with a New Twist.” Well, we have done more than survive in this states grape and wine industry, and I think if Munson were alive today he would give a bow to the state he left. This year has been no different than years in the past–some parts of the state have suffered more than others, and thus grape quantity and quality vary radically. We came out on the good end here at Capitol View. We not only have some really great wines taking shape in the cellar; we have developed some great relationships with growers in the process. Experimental wines from a few of my new hybrids have come up with flavor profiles not found in any other grapes I have experienced, so further trials will be put in this spring. I heard from a colleague just recently that he thought that Nebraska winemakers were the best in the region, because they had to work harder than anyone else to produce a good product. This may be painting with a broad brush, but it does hold some merit, and some grapes born elsewhere seem to prefer one of our four climates. Some might say we need variables in this state to keep from boredom; nothing could be further from the truth. Although in need of an identity, our sea of red has no equal in the universe of fandom, and of our entrepreneurial spirit one could say the same. This land can be breathtaking in it’s rolling hills, sea of grass, and it’s wide open skies. I didn’t plan on it when I said “sea of red”, but it turned out to be a double entendre. I truly believe in the next five to ten years we could not only be producing some of the highest quality reds here in the upper great plains, but also be recognized for it elsewhere. Now on a yummy note. If you haven’t signed up for the Winemakers dinner, “Hunt for the Reds of October,” I’ll give a taste of what you’re missing. It’s being held at the winery this Thursday evening October twelve, starting at six-thirty with hors d oeuvres, and dinner at seven. This is a multi-course dinner created by Doorstep Diner, paired with Capitol View favorites and a new red released just for our guests. The chef will talk about pairing courses, I’ll talk about flavor profiles and the grapes involved in the making of the wines, and all the guests have to do is have fun and enjoy. I invite you to take a look at the events page even if you can’t attend, and maybe we’ll see you next time around. As I write this I’m seeing some great fall colors. Take a minute to enjoy. Take care in your daily ventures.